On behalf of the Regional Transportation Authority (RTA) staff and Board of Directors, I want to take a moment to celebrate the RTA’s accomplishments in 2016 and highlight how they may enhance transit service in 2017 and beyond. 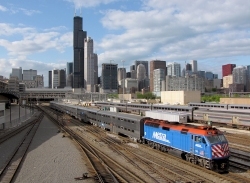 The RTA is the unit of local government charged with regional financial and budgetary oversight, funding and transit planning for CTA, Metra and Pace (the Service Boards). The work of the RTA is critical but it may not always be easy for riders to see. 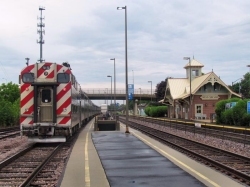 For instance, in 2016 the RTA’s Community Planning Program provided resources and expertise to help Aurora, DuPage County, Morton Grove and Olympia Fields begin projects that utilize existing transit assets and promote economic development. The RTA’s Access to Transit Program benefited riders in Rolling Meadows, Glen Ellyn and Palos Heights, as those communities leveraged RTA allocated funds to create sidewalks and crosswalks that make it easier and safer for riders to reach transit. Specifically, the Board and I would like to share how the RTA’s work helps move our region toward the goals of the 2013-2018 Regional Transit Strategic Plan, jointly established by CTA, Metra and Pace and the RTA. In 2016, the RTA directly allocated $12 million of Innovation, Coordination and Enhancement (ICE) funding to support various important Service Board projects. The ICE program provides funding assistance to enhance the coordination and integration of public transportation and to develop and implement innovations to improve the quality and delivery of public transportation. Eleven local paratransit projects continue to operate with the funding we administer from the federal Section 5310 Enhanced Mobility of Seniors and Individuals with Disabilities Program in throughout the RTA region. This year, ten projects received additional funding to sustain operations through 2017. The RTA updated printed RTA System and Downtown Maps and local Sub-regional Maps were developed for the first time in 20 years. And, the RTA’s Transit Benefit Program, which provides lost-cost administration of pre-tax transit benefits for small companies, grew nearly three percent in 2016, adding 122 new companies to the roster. I am proud to report that the RTA’s credit rating remains among the best in the public sector. This enables the agency to pursue short term borrowing to manage delays in state funding and long term financing, such as bond sales, to support the region’s capital needs. This is especially crucial as there is currently no capital funding from the state in the RTA’s five year capital program. This year, the RTA issued 30-year General Obligation bonds through a competitive sale to finance $100 million of Service Board capital projects. The RTA continued its commitment to ensuring that all riders have access to safe and reliable public transportation. Two new Mobility Centers – one each on the north and south sides of Chicago – were constructed to better serve regional ADA paratransit and travel training customers. The RTA also created a new Mobility Outreach program that will eventually place RTA staff in each of the region’s six counties to provide presentations on the transit services available for people with disabilities and older adults. We are working with the Service Boards to implement a customer satisfaction survey to hear directly from riders about how we are doing. We were also proud to produce several reports each year that measure and compare our regional system performance. We know that there were more than four billion passenger miles traveled on our system last year and our system continues to have the lowest operating cost per passenger mile of our peers. The RTA continues to advocate for state transit operating funding for the region as the state of Illinois continued to operate without a state budget for most of fiscal year 2016. In response to this legislative stalemate, the RTA worked to identify unfunded priority capital needs over the next decade and with the Illinois Department of Transportation (IDOT) to manage cash flow for state-funded capital projects. At the end of June, the state passed a full-year state transportation budget which included funding for fiscal years 2016 and 2017. The Board and I are extremely proud of the work the RTA staff does day in and day out and, as we look ahead to 2017, we look forward to a new year of collaboration and service.